Israeli soldiers, on Tuesday, sprayed racist graffiti on the walls of several Palestinian homes in the town of Beit Ummar, north of Hebron, according to a local activist. 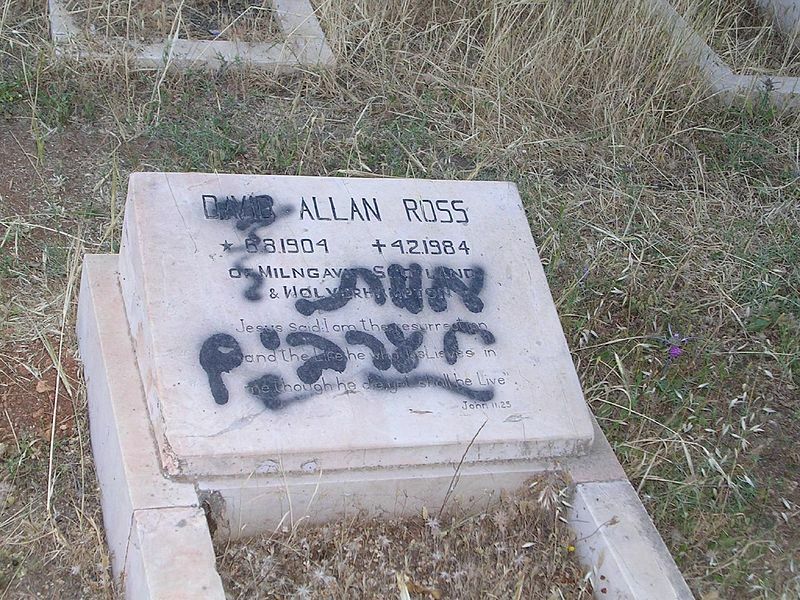 WAFA reports that the coordinator of the popular committee against settlements and the Apartheid Wall, Mohammad Awad, said that a number of soldiers raided the town and sprayed racist graffiti on several homes such as, “death to Arabs” and “the people of Israel are strong”. Racism against Arabs, on the part of the Israeli state and Israeli Jews, has been identified by critics in every aspect of Israeli society, including personal attitudes, the media, education, immigration rights, housing segregation, and social life. Dozens of Israeli soldiers invaded the al-‘Arroub refugee camp, north of the southern West Bank city of Hebron, and clashed with local youths; five Palestinians and two Israeli soldiers were wounded. Eyewitnesses said that local protesters hurled a Molotov cocktail at the invading soldiers, wounding one in the leg, while another soldier was hit by a brick in his upper body. They added that the soldiers fired dozens of rubber-coated metal bullets, gas bombs and concussion grenades, wounding five Palestinians while several others suffered the effects of tear gas inhalation. Furthermore, scores of soldiers were extensively deployed at the entrance of the camp, especially during evening hours, and harassed residents trying to enter or leave it. Medical sources in the camp said that at least thirty Palestinians have been injured by rubber-coated metal bullets, while dozens suffered the effects of tear-gas inhalation during repeated military invasions over the past three days. In related news, soldiers installed two mobile homes on a land that belongs to the al-Khader town, south of the West Bank city of Bethlehem. Palestinian security sources in Bethlehem have reported that Israeli soldiers removed a military tower that stood in the Om Rokba area, south of al-Khader, and installed the two mobile homes to expand an illegal outpost. Om Rokba is subject of frequent and escalated attacks carried out by Israeli soldiers and extremist settlers, while several residents received property destruction orders, and others were ordered to stop constructing homes and facilities in their own lands. Israeli occupation forces (IOF) fired teargas and sound bombs at Palestinian homes in Aroub refugee camp, south of Al-Khalil, on Monday morning. Eyewitnesses said that confrontations erupted in the refugee camp after IOF soldiers raided the camp’s entrance amidst heavy firing of teargas and sound bombs. Violent clashes had erupted last night in the camp during which dozens of camp inhabitants were hurt. The Hamas Movement said that any invasion of the Gaza Strip would be a very risky and failed adventure for the Israeli occupation state, which always pays dearly for its reckless acts and do not learn the lesson. This came in response to recent Israeli threats to reinvade Gaza and enable the Palestinian Authority to rule it again. Yuval Steinitz, Israel's minister of intelligence, international relations and strategic affairs, said on Saturday that Israel would have no choice but to go inside the Gaza Strip in order to eliminate Hamas and allow the Palestinian Authority to regain control of its affairs if the Palestinian rockets kept landing in Israeli areas. Senior Hamas official and lawmaker Mushir Al-Masri stated in press remarks to Quds Press that the Israeli leaders who had preceded Steinitz to such remarks had already tried their luck in Gaza and failed to achieve their goals. "The invasion of the Gaza Strip by land is what the resistance wishes for because Gaza would be a graveyard for the Zionists," Masri said, adding that "the occupation would commit a folly and its leaders would bite their fingers in regret if they thought to do so." The Hamas official said further that Israel would pay a huge price for any coming folly in Gaza and its army would drag tails of defeat and ignominy behind it. "The resistance today is much stronger than ever before and our people strongly rally around it all the time," he added. 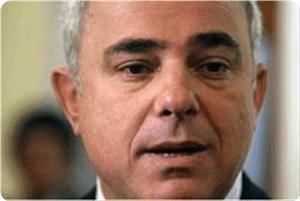 For its part, the resistance committees in Palestine condemned Steinitz's war threats and described him as "terrorist." The resistance committees said in a press release on Sunday that Steinitz's threats were no more than another Israeli media stunt and muscle display, and could not frighten the Palestinian people and their resistance. It stressed that the Palestinian resistance in Gaza is way stronger than before and ready to retaliate to any Israeli aggression. 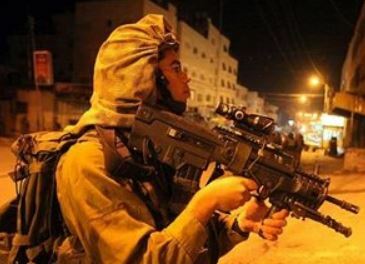 Violent clashes broke out on Sunday evening between the Israeli occupation forces (IOF) and Palestinian young men in Qabatiya town to the east of Jenin. Local sources told the Palestinian information center (PIC) that the invading troops stormed Souk Qabatiya area and engaged in provocative acts against the Palestinian residents in Al-Hisba neighborhood, which raised the ire of the young men there. Consequently, a hail of stones were hurled at the soldiers who responded by firing tear gas grenades at the angry young men. Several citizens in the area suffered from tear gas inhalation. A few minutes earlier before the confrontations, the IOF stormed and ransacked a residential building in Qabatiya town and forced its occupants to leave their apartments. The IOF also closed in the evening the road that leads from Qabatiya to Jenin and intercepted and searched passing vehicles. In another incident on the same day, scores of Palestinian citizens suffered tear gas injuries during fierce confrontations with a large number of Israeli soldiers in Al-Aroub refugee camp, north of Al-Khalil city. 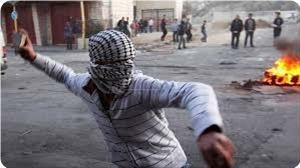 Eyewitnesses said that the IOF fired intensively tear gas grenades and rubber bullets at dozens of young men who responded by throwing Molotov cocktails and stones. They added that the events took place in different areas inside the camp including Al-Jawabreh neighborhood and the areas near Omar Ibn Al-Khatab Mosque and the UNRWA office. During the events, Israeli military helicopters dropped flares over the camp and more reinforcements poured in, while some soldiers occupied some rooftops of homes. Israel has issued a fresh threat of war against the Gaza Strip, saying rockets fired from the Palestinian territory are enough reason for Tel Aviv to invade the besieged enclave. Israeli Intelligence Minister Yuval Steinitz on Saturday said Tel Aviv would have to soon invade Gaza and destroy the Palestinian resistance group Hamas. “If the drip of rockets from Gaza continues, we will have no choice but to go inside [Gaza] in order to eliminate Hamas, and allow the Palestinian Authority to regain control of the Gaza Strip,” Steinitz said. This is the second such threat by top Israeli officials over the past month. In late December 2013, Israeli Prime Minister Benjamin Netanyahu threatened more assaults on the Gaza Strip after the regime’s military launched several air raids on Gaza City. The saber-rattling comes at a time when Israel has also intensified its aerial and ground attacks against the coastal sliver. On Friday, 10 people were injured after Israeli F-16 warplanes carried out three airstrikes on the northern, eastern and southern parts of the Palestinian territory. Israeli forces launched a similar airstrike on the blockaded Gaza Strip on January 22, killing two Palestinians. The Israeli military also frequently targets Palestinians along the border with Gaza, which remains literally cut off from the outside world by a crippling Israeli blockade. Attacks against Gazans continue despite a 2012 Egyptian-mediated truce that ended a deadly Israeli onslaught against the territory. 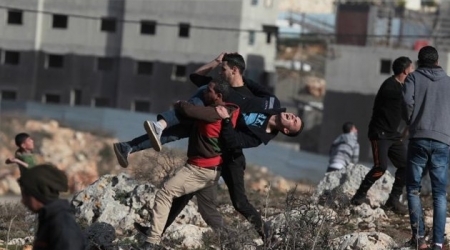 Over 160 Palestinians were killed and some 1,200 others were injured in the eight-day Israeli offensive. 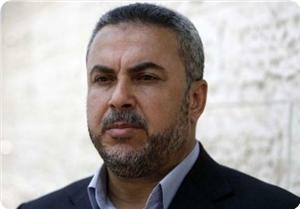 An Israeli minister has threatened to invade the Gaza Strip if Palestinian rockets continues to land in Israeli areas. Steinitz also spoke about the Jordan Valley, and said "we must continue holding the Jordan Valley, in order to maintain the security of the state of Israel." The Israeli occupation forces (IOF) stormed last night and at dawn Sunday many neighborhoods and areas of Nablus city, and clashed with young men in Hawara and Beta town to the south of the city. According to the Palestinian information center (PIC) reporter in Nablus, a large number of Israeli troops raided the areas of Karoum Ashour and Ras Al-Ein to the west and embarked on videotaping their streets and alleys. The IOF also stormed Beta town and clashed with young men who blocked roads with torched tires and stoned their armored vehicles. Eyewitnesses reported that the invading troops forced storekeepers to close their businesses in Beta and Hawara towns, and physically assaulted one of them after he did not close his store quickly. Israeli forces stormed the northern West Bank towns of al-Jalamah and Qabatia near Jenin on Sunday morning and ransacked several homes. Palestinian security sources told Ma'an that Israeli forces in al-Jalamah stopped a teenage peddler named Muhammad Ibrahim Nuerat from Jenin while he was selling clothes at roadside stand near al-Jalamah checkpoint. The sources added that ten Israeli military vehicles also stormed Qabatia and inspected several homes. Local sources said that the soldiers inspected the homes of Khalil Salih Sabaanah, Ibrahim Said Sabaanah and Mustafa Shamma Sabaanah before they left the town. An Israeli spokeswoman said that she did not have any information on the raids. Palestinian minister of religious affairs Ismail Radwan strongly denounced the Israeli bombing of Rafah area in Gaza a few days ago, which caused considerable damage to Al-Ferdaws Mosque. In a press release, Radwan stated that Israel's targeting of mosques is a serious violation of the international law which stipulates the need to respect the holy sites of all nations. He stressed that Israel, which commits daily crimes against the Palestinians and their property, is no stranger to such act. The minister called on the Arab and Muslim nations, and the world's free people to urgently move to defend the holy sites in Palestine and assume their role in protecting the Palestinian people against Israel's aggression. In another context, the Palestinian health ministry in Gaza said six Palestinians were killed and 41 others suffered injuries during Israeli shooting incidents and aerial attacks in last January. Last January is considered the deadliest month since Egypt brokered a truce deal between the Palestinian resistance in Gaza and the Israeli occupation. Since the truce took effect in November 21, 2012, the Israeli army has killed 18 Gazans, and kidnapped and wounded many others, including 60 fishermen. A lawyer for the Palestinian Authority ministry of prisoners' affairs Tariq Barghouth alleged on Saturday that Israeli forces launched attack dogs on two Palestinian youths after shooting them multiple times on Thursday night at a checkpoint near Jerusalem. Adam Abd al-Rouf Jamous, 17, and Jawhar Nasser al-Din Halbieh, 19, were mauled by police dogs after Israeli forces opened fire on them without warning near al-Zayyem checkpoint near Abu Dis east of Jerusalem on January 30, Barghouth said. The pair were visiting a friend's home nearby when Border Police suddenly opened fire in their direction before siccing the dogs on them. Barghouth explained that the dogs mauled Jawhar Halbieh's body and inflicted numerous wounds before soldiers dragged the two youth on the ground for a distance of 300 meters while simultaneously beating them with rifle butts and kicking and punching them. The beatings causing numerous fractures in their body, Barghouth added, and they were later transferred to Hadassah Hospital in Ein Karem. Barghouth added that he had visited the pair in the hospital and found that they had suffered severe injuries, both as a result of the bullets fired at them as well as a results of the beatings, which had caused numerous broken bones. He added that were being held in the hospital under guard by three Israeli soldiers. He pointed out that both of the youths had been shot numerous times all over their bodies. Bargouth said that occupation authorities had prevented the families of the two prisoners from visiting them in the hospital and that he planned to launch a complaint against the Border Guard soldiers for their brutal treatment of the youths. The Israeli occupation forces (IOF) last Thursday unjustifiably caused serious bullet injuries to two young men and let their police dogs maul them before they brutally beat them and took them into custody, according to the lawyer of the ministry of prisoners 'affairs in Ramallah. Lawyer Tareq Barghouthi stated on Saturday that 17-year-old Adam Jamous and 19-year-old Jawhar Halabiya, both from Abu Dis town in east Jerusalem, suffered several bullets injuries when Israeli border soldiers suddenly opened fire at them as they were on their way to visit one of their friends in the town on the 30th of last month. Barghouthi, who visited the young men in hospital, said that the Israeli soldiers also unleashed their dogs on them before they dragged them some 300 meters away and kept beating them with their rifle butts, hands and feet despite their serious injuries. He affirmed that the two young men are in very difficult health conditions and suffer from multiple bullet wounds, bruises and fractures. The lawyer noted that the young men are now under tight police guard in Hadassah Ein Karem hospital in occupied Jerusalem and banned from seeing their families. The area stretches from the northern town of Beth Hanoun all the way down to Rafah, the most southern tip of the blockaded enclave. People who move around in the vicinity of that area are usually the target of trigger-happy Israeli soldiers. Most of the shooting victims are teenagers and people in their early twenties. Some have died of their wounds while others have sustained serious injuries. PRESS TV interviewed 23-year-old Ahmad Abu-eshkayan at his hospital bed. His leg was shattered and its arteries and nerves have been severed after he was shot by Israeli forces. 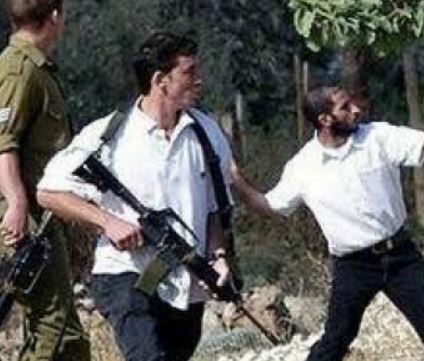 A number of Israeli settlers attacked several Palestinian villagers working on their own lands in Wad Abu ar-Reesh -- Khirbit Safa area -- in Beit Ummar town, north of the southern West Bank city of Hebron. Mohammad Awad, spokesperson of the Popular Committee against the Wall and Settlements in Beit Ummar, said that several settlers invaded Palestinian farmland and orchards, close to the illegal Beit Ayen settlement. He added that the settlers assaulted the villagers, and pushed them out of their lands while threatening and cursing at them. The attack comes just a few days after settlers attacked local villagers in the same area. On Wednesday, settlers uprooted more than 25 Palestinian olive trees in Madama village, south of the northern West Bank city of Nablus. Israeli soldiers shot and wounded 10 Palestinians near the West Bank town of Ramallah during a protest Friday over the killing of a teenager, Palestinian medics and security sources said. In Gaza, meanwhile, medics said five more Palestinians were wounded by Israeli army gunfire near the border fence with Israel. The sources said the Palestinians in the West Bank were hit by live rounds on the outskirts of Jalazun refugee camp and hospitalised in Ramallah, including one with serious injuries. 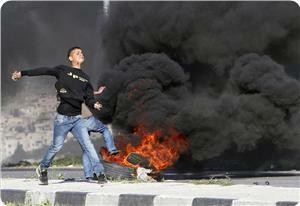 Hundreds of Palestinians took part in the protest, many of them hurling rocks at the soldiers. The demonstration was called to protest at the Israeli army's killing on Wednesday of Mohammed Mubarak, a 19-year-old from Jalazun working on a project funded by USAID and son of the camp's locally elected leader. The army said he was shot dead near a Jewish settlement outside Ramallah after opening fire on them, but witnesses insisted he was unarmed. Palestinian housing and public works minister Maher Ghneim [in the West bank] has condemned what he branded the "cold-blooded killing" of a labourer working on a project run by the ministry in coordination with USAID. Ghneim said the youth had been "carrying a sign to direct the traffic" when he was shot. A total of 27 Palestinians were killed by the Israeli army in the West Bank in 2013, three times more than the previous year, figures from Israeli rights watchdog B'Tselem showed. In central Gaza, five Palestinians were shot and wounded Friday as they threw rocks at soldiers on the other side of the border fence, medics said. An army spokeswoman, contacted by AFP, said dozens of demonstrators hurled rocks and had approached the fence inside a military exclusion zone. The soldiers first fired warning shots before targeting the protesters, she said, adding that at least one Palestinian was hit. The Palestinian TV has reported, on Friday evening, January 31, 2013, that at least fourteen Palestinians were injured, one seriously, during clashes with Israeli soldiers invading the al-Jalazoun refugee camp, north of the central West Bank city of Ramallah. Eyewitnesses said soldiers, stationed at the entrance of the camp, fired rounds of live ammunition, gas bombs, and rubber-coated metal bullets at dozens of residents who marched following evening prayers, to protest the death of Mohammad Mubarak who was killed by the army three days ago. Fourteen Palestinian were shot and wounded by army fire, and were moved to local hospitals and medical centers, one of the wounded suffered a serious injury. The Palestinians were protesting the death of Mohammad Mubarak, 20, who was shot, and killed, by Israeli soldiers on Wednesday while conducting road repairs as part of a project conducted by the Ministry of Labor. The project is financially supported by the USAID (U.S. Agency for International Development). Eyewitnesses and coworkers said Mohammad was a flagger, organizing traffic and was wearing clearly marked work uniform when the soldiers shot him dead. The army claimed the victim carried a weapon, but numerous eyewitness testimonies confirmed he was working, did not carry any weapon, and never posed any threat against the soldiers. 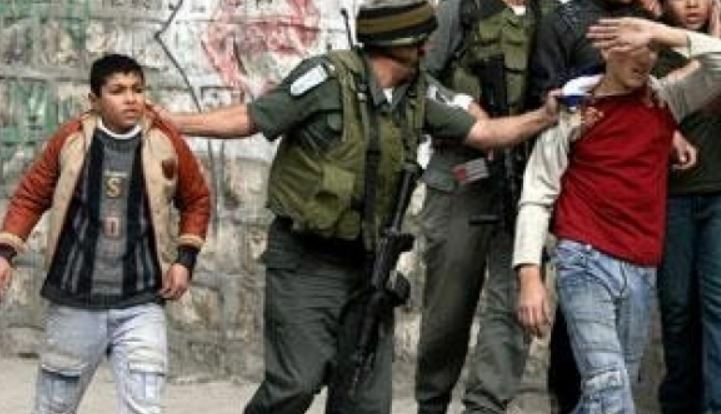 Dozens of Israeli soldiers invaded the southern West Bank district of Hebron, and kidnapped five Palestinians, including two children. Army attacks a soccer match north of occupied Jerusalem. Local sources in Hebron city have reported that the army invaded the Sheikh neighborhood, in Hebron city, and kidnapped Mo’taz Nasser Ed-Deen, 20, Mohammad Abu al-‘Adas al-Qawasma, 18, Safwan Ahmad Ja’bary, 20, and two children who remained unidentified until the time of this report. The five were cuffed, blindfolded and were moved by the soldiers to a nearby Israeli military base. Furthermore, soldiers invaded the Wad Abu al-Qomra and Tarousa areas, in the Doura town south of Hebron, and fired concussion grenades at a number of homes. The army also invaded the nearby towns of Yatta and at-Thaheriyya, and installed roadblocks at the entrances of Joret Bahlas area, north of Hebron city, Sa’ir and Halhoul towns, and the al-Fawwar refugee camp. They stopped and searched dozens of Palestinian cars, and interrogated scores of Palestinians while inspecting their ID cards. In related news, soldiers invaded the West Bank city of Bethlehem, and kidnapped Mohammad Ahmad Breijiyya, 26, coordinator of the Popular Committee against the Wall, before taking him to an unknown destination. 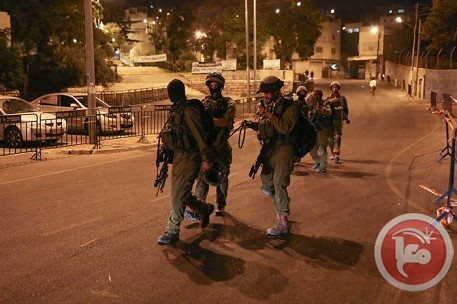 On Friday evening, soldiers kidnapped seven Palestinian children, near the Bilal Bin Rabah Mosque, north of the West Bank city of Bethlehem. In addition, dozens of soldiers fired gas bombs at a soccer match in the Ar-Ram town, north of occupied East Jerusalem forcing the residents out of the stadium. The match, between the al-Biereh Youth Foundation and the Islamic Club of Qalqilia, was being held at the Faisal al-Husseini Stadium; soldiers attacked the Palestinians seven minutes into the match. 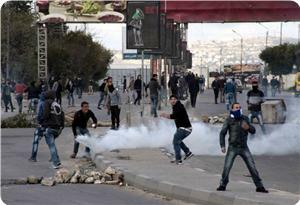 Dozens of Palestinians suffered the effects of tear gas inhalation. Several Palestinian and foreign activists suffered injuries on Friday afternoon when the Israeli occupation forces (IOF) violently attacked their peaceful marches against settlement activists. Many protestors, including a foreign journalist, suffered injuries when the IOF subdued a march in Nabi Saleh village protesting the establishment of Halamish settlement on Palestinian-owned lands in the village. According to local sources, the Israeli army had sealed off the vicinity of Nabi Saleh village in the morning and deployed dozens of its soldiers around the village in order to prevent the protestors from marching towards the annexed areas. The IOF also suppressed the anti-wall march of Masarah village and prevented the protestors from approaching the segregation wall. 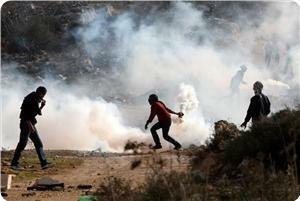 Dozens were hurt as Israeli soldiers heavily fired tear gas to disperse the protesters. In the weekly anti-wall protest of Bil'in village, some of the protestors held banners condemning Israel's settlement expansion and the cold-blooded murder of Mohamed Mubarak, a young man from Al-Jalazoun refugee camp who was killed as he was en route to his workplace. Some of the participants in Bil'in march delivered speeches denouncing Israel's ongoing crimes against the Palestinians. The speakers demanded human rights groups to work on holding Israel accountable for the killing of Mohamed Mubarak a few days ago and for its repeated violations against the Palestinians and their property. In another incident, Israeli undercover soldiers wearing Arab attire kidnapped six kids near the Intercontinental hotel in Bethlehem city. Local sources said that the Israeli undercover agents took the kids to the checkpoint 300 at the northern entrance to Bethlehem, noting that their kidnapping coincided with clashes between Palestinian young men and Israeli soldiers in Aida refugee camp. 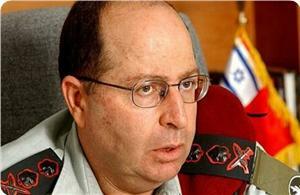 Moshe Ya'alon, the Israeli war minister, held Hamas Movement responsible for the continuous rocket fire from Gaza Strip towards the Israeli entity. "We will not tolerate rocket fire towards Israel or any attempt to return to the situation before Operation Pillar of Defense," he said in his remarks to Walla Hebrew website on Friday. 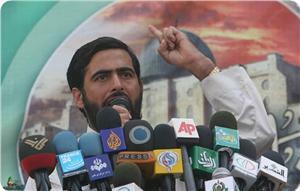 "We will respond decisively to any attempts to harm Israeli citizens or disrupt their lives", he added. He held Hamas responsible for everything that happens in the Gaza Strip, saying that "it would pay a heavy price if it did not act to prevent rocket fire and attacks against Israel from Gaza." Seven Palestinian civilians suffered injuries including three children in renewed Israeli aerial attacks at dawn Friday on different areas of the densely-populated Gaza Strip. More than 30 Palestinians were seriously wounded as violent clashes erupted in Jalazoun refugee camp between Israeli occupation force and hundreds of angry youths who took to the streets after Friday prayers protesting the IOF cold-blooded murder of Mohammed Mubarak. Large and unexpected numbers have participated in the protest march, which prompted Israeli soldiers to react hysterically, a PIC reporter said. According to the PIC reporter, Israeli soldiers deliberately and directly fired at the protesters, where 30 of them were shot by live bullets and dozens others were injured by rubber bullets including a press photographer. Ahmed Hamdan, 18, was transferred to hospital in very critical situation after being shot in his neck. In turn, Palestinian youths threw stones and empty bottles at Israeli forces and set fire to a number of tires in the main street adjacent to Jalazoun camp. On the other hand, violent clashes broke out in Silwad town east of Ramallah which led to a number of injuries among Palestinian youths. Three Palestinians were treated for minor injuries, while another was transferred to Ramallah hospital after being shot by live bullets. 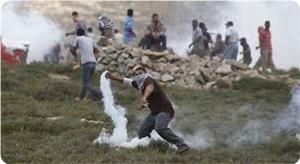 Israeli occupation forces heavily fired tear gas bombs at the nearby houses. Meanwhile, violent clashes erupted between dozens of Palestinian youths and IOF soldiers stationed at Attara checkpoint south of Ramallah. The soldiers used rubber bullets and tear gas bombs heavily during the clashes, the PIC reporter said. The clashes came two days after the killing of Mohammed Mubarak, a young man from Jalazoun camp, who was murdered by Israeli soldiers as he was en route to his workplace on Wednesday.